AwesomeCloud’s virtualization and cloud infrastructure are powered by Microsoft cloud solutions, including Windows Server 2012 R2, Hyper-V and System Center 2012 R2. The combination of these solutions enables your organization to deliver enterprise-class hosted white label cloud services to each of your clients with key features such as 100% uptime, dynamic resource allocation, redundancy, and monitoring. Windows Server 2003 and 2008 are also available. Microsoft’s flagship operating system is designed for advanced cloud-enabled data centers. It’s a fantastic new tool available to all of our partners that will enable them to become a more efficient technology provider. Windows Server 2003 and 2008 are also available. Hyper-V is one of the tools that enables AwesomeCloud to offer a 100% uptime SLA. The latest enhancements to Hyper-V increase security, performance, and improve networking so you can provide a comprehensive solution to each of your clients. With support for System Center 2012 R2, AwesomeCloud can easily and effectively manage your private, hosted and public system resources from a unified console ensuring that your cloud services are always available and operating at peak efficiency. 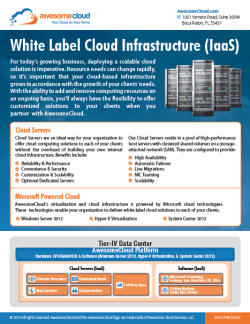 Partner with AwesomeCloud and resell white label Microsoft cloud technology to grow your Managed Services business. Contact us by phone at 855.2.THECLOUD, by email at sales@awesomecloud.com, or by filling out a quick contact form.